Sometimes it’s difficult to make it into the real pet store and when you do visit its always quite distressing leaving behind all those animals that need a loving home. 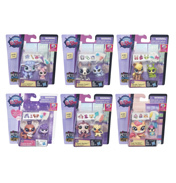 Now you can have a pet shop of your own, even if it is with the littlest pets. Plus there is none of that muckiness - you know smells, accidents and the such like! These pets may be tiny, but their big, big world is literally overflowing with pets who just want to have fun. Pet sitting is easy and with oodles of different pets (over 1,000!) to collect it is difficult to know where to start so let us help you out a little. Insects such as Butterflies, Bumblebees, Ladybirds, Dragon Flies, Worms, or Snails. Aquatics such as Angel Fishes, Whales, Sea Turtles, Octopi, Guppies, Seahorses, Seals and Frogs. Large animals such as a Pigs, Ponies, Kangaroos, Pandas, Bears, Cows, or Deer. Small pets such as the Angora Bunny, Cats, every kind of dog imaginable, Mice, Hamsters, Squirrels, Anteaters, and Chinchillas. Birds such as Doves, Peacocks, Flamingos, Pigeons, Pelicans, Ducks. All in a wide range of different styles and colours – just like real breeds are. Although to be honest some of their colourings are a little strange. Play in lots of little pet places, enjoy many pet related adventures. Run the pet shop with your friends and have your own 'pet of the day, week or month'. Take them all over with you in one of the Pet Carriers, and they are perfect for pockets, handbags and backpacks and travel well unlike normal pets! Run competitions at home just like Crufts to see which of you has the Best in Breed, or Best in Show. Or maybe partake in a little pet training and see who can win agility or even obedience. Try running a pet rescue centre too and perhaps take in any stray or ill pets with the Littlest Pet Shop Get Better Centre which has everything you need to put them right and give them a new start in life. One word of warning though, keep them away from the Vacuum Cleaner though as this is their arch nemesis! These figures are brought to you by Hasbro and are cute beyond belief. 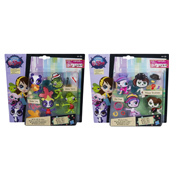 Buy one of the Pack of Pets today to cosy up to these, itsy-bitsy, teeny weenie cuties. You are sure to meet some of the sweetest, coolest and quirkiest animal pals around! Your imagination is the only limit. Welcome some new friends today and make all your pet dreams come true. Remember too one of the RSPCA's key messages - a Pet is for life, not just for Christmas - even if they are the littlest.